Can you believe we're into August already? There's a new Color Throwdown Challenge happening with a combo of more somber colors - black, white and copper - brought to us by Amy Rohl! I'll have to admit I really liked this striking combo which was very much out of the norm for me. Fortunately, I didn't need a sympathy card, but thought this would work to build up my stash. 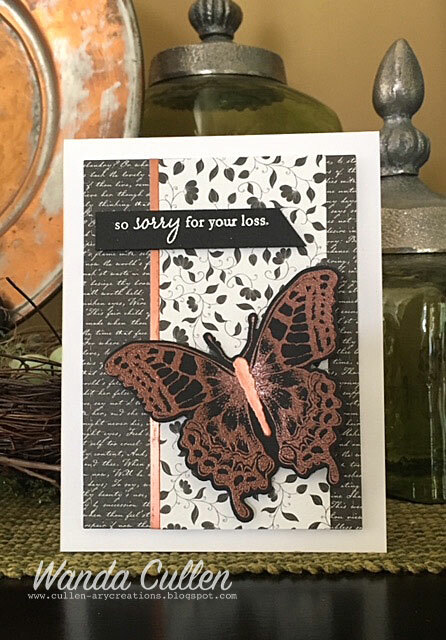 I copper embossed the butterfly from a Tim Holtz stamp/die set by Sizzix. I popped it up on foam tape (along with the sentiment which is from PTI's Blooming Button Bits set). A touch of metallic copper cardstock was added for detailing and this was a quick and easy card to throw together! Patterned papers are from Bazzill Basics Paper "Licorice" 6x6 pad. We're really excited to have the talented Joy Taylor from Simple By Design as our August guest designer! You will not want to miss her awesome samples!